In 2008, experts predicted gas would hit $20 a gallon; it peaked at $4.10. In 1967, they said the USSR would be the world's fastest-growing economy by 2000; by 2000, the USSR no longer existed. In 1908, it was pronounced that there would be no more wars in Europe; we all know how that turned out. Face it, experts are about as accurate as dart- throwing monkeys. And yet every day we ask them to predict the future- everything from the weather to the likelihood of a terrorist attack. 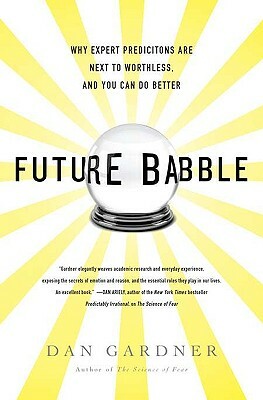 "Future Babble" is the first book to examine this phenomenon, showing why our brains yearn for certainty about the future, why we are attracted to those who predict it confidently, and why it's so easy for us to ignore the trail of outrageously wrong forecasts. Dan Gardner is a columnist for the "Ottawa Citizen" and has received numerous awards, including the Michener Award and the Amnesty International Canada Media Award. He lives in Ottawa, Canada. "Future Babble is genuinely arresting... required reading for journalists, politicians, academics and anyone who listens to them." "If you are paying a lot of money for forecasting services-be they crystal ball gazers or math modelers or something in between-put your orders on hold until you have had a chance to read this book-a rare mix of superb scholarship and zesty prose. You may want to cancel, or at least re-negotiate the price. For the rest of us who are just addicted to what experts are telling us everyday in every kind of media about what the future holds, Future Babble will show you how to be a bit smarter than what you usually hear."